As a big fan of American muscle cars since I was a kid…and spent my high school years driving around with friends in classic 60’s Dodge Chargers and Pontiac Firebirds. I’ve been amazed at the price inflation that we’ve seen on many of the most iconic examples of Detroit performance before the EPA and gas crunch of the 1970s. These cars were iconic, and the most valuable were built in limited numbers. It is interesting to compare the production numbers of some of the rarest and most valuable muscle cars against those of the BMW Z3 M Coupe. A total of 2858 M Coupes were built [for the North American market], including 452 with the sunroof delete. Of those only 678 were built with the desirable S54 engine (110 sunroof deletes). In some exterior/interior color combinations, there are Z3 M Coupes that had build quantities in the single digits. One of the most collectible American muscle cars is the 1970-1971 Plymouth Cuda with the 426 Hemi engine. I recently saw a 1970 Hemi Cuda at the Gateway Auto Museum in Gateway Colorado and it prompted me to compare the production numbers of valuable muscle cars against the M Coupe. In 1970 there were 652 Hemi equipped Cuda’s hardtops built, as well as an additional 14 convertibles. In 1971 only 108 hardtop Hemi Cuda’s were built with only 9 additional convertible. That means that a total of 760 hardtop and 23 convertible Plymouth Cudas were built with the 426 Hemi powerplant. Original numbers matching Hemi Cudas routinely hit six figure prices at auction. Another eponymous and highly sought after American muscle car is the Plymouth Superbird and Dodge Charger Daytona. Designed solely to homologate the cars to race on the NASCAR superspeedways with their pointed noses and huge rear wings, the Superbird and Daytona looked like no other cars coming from Detroit. Sales were difficult, and a number of these rare cars were converted back to “stock” Roadrunners or Chargers by dealers who were unable to attract buyers. 553 1969 Dodge Charger Daytonas were built, with 70 of those having the 426 Hemi. There were 1935 1970 Plymouth Superbirds built, with 135 of those with the Hemi. If you want one of the most outrageous cars from Detroit…there were 2,488 built. Bowtie fans are no doubt familiar with the Camaro COPO. The GM Central Office Production Order was a means by which dealers could order cars built with engine combinations not available to the general public. The Camaro COPO consisted primarily of the Camaro chassis with an iron block 427 L-72 engine shoehorned into it. These cars were sold by Yenko, Baldwin Motion, Nickey and Dana. At least 1015 COPO Camaros were built (the actual production numbers from GM are a bit hazy) as well as 69 of the rare COPO 9560 ZL-1 Camaros with an aluminum block 427. The Chevrolet LS6 454 cubic inch engine was a monster, both at the stoplight and the drag strip. Chevrolet’s highest performance production big block engine, the LS6 was available in the 1970 Chevelle Coupe, Convertible or El Camino. There were 4,475 vehicles equipped with the LS6 that were built by Chevy, but there is no way to come up with hard numbers on how many ended up in coupes, convertibles or El Camino’s. Nevertheless, all of the 4,475 original LS6 equipped Chevy’s are still very rare and very valuable. The 1967 Corvette represents the pinnacle of Zora Arkus-Duntov’s 2nd generation American sports car, and also represents the most sought after classic Corvettes. This is particularly true of the 427 equipped ’67 Vette. There were four different 427 engines that were offered in the Corvette, starting with the 390hp L36, or which 3,832 were built. There were 2,101 of the 400hp L68 427 Corvettes produced. Very popular, the most powerful standard production option was the 435hp L71 option, of which 3,754 were built. The rarest of all was the L88, which was officially rated at 430hp but put out more than 500hp, only 20 were built. The L88 1967 Corvette is the most collectible and expensive classic Corvette around. Still, if you want a 1967 Corvette with a 427 cubic inch V8, there were 9,707 built. All Blue Oval fans have heard of the Boss Mustang. Built to homologate the 1969 Ford Mustang for the Trans-Am racing series, the Boss 302 featured “race” suspension and a special 302 cubic inch engine. It was one of the best handling cars of the muscle car era. In 1969 Ford built 1,628 Boss 302s, with 7,013 more in 1970. At the same time, Ford responded to the potent Chrysler 426 Hemi with their own 429 cubic inch block which also featured hemispherical cylinder heads. Contracting with Kar Kraft to wedge the Ford 429 engine into the tight confines of the 1969 Mustang, a street and strip legend was born. Much rarer than the more affordable Boss 302, there were 859 of the potent Boss 429s were built in 1969 with an additional 499 in 1970. All told, there were 8,641 Boss 302 Mustangs built by Ford and another 1,358 Boss 429 Mustangs built by Kar Kraft. Carroll Shelby’s partnership with Ford produced some of the most sought after Mustangs ever built. While the first Shelby Mustangs in 1965 were designed primarily for racing, the Shelby brand evolved in to become the boutique performance arm of Ford before the relationship soured in 1969. In 1965 Shelby built 562 GT350 Mustangs. In 1966 Shelby produced 2,380 Mustang GT350s (including 1,003 for Hertz Rent A Car). In 1967 Shelby built 1,175 GT350s and 2,048 of the new big block GT500s. In 1968 1,253 GT350s were made with an additional 404 GT350 convertibles. In 1968 2,073 GT500 coupes were made with an additional 720 GT500 convertibles. In 1969/1970 Shelby built 1,279 GT350s and 1,871 GT500s. A grand total of 13,912 Shelby Mustangs of different flavors were built between 1965 and 1970. You cannot speak of Carroll Shelby without mentioning the Shelby Cobra. A tiny AC Ace ladder frame roadster chassis, with a stout Ford V8 engine under the hood. The Shelby Cobra initially featured the Ford 260 cubic inch engine, of which 75 were built before changing to the more powerful 289 cubic inch engine. There were 580 Cobras built with the 289 powerplant, including 455 street cars, 29 factory team cars (including the Daytona Coupes), and 95 factory prepped competition cars. These were followed by the awesome big block powered Shelby 427 Cobras. There were 348 Shelby 427 Cobras built, including 260 street cars, with an additional 88 built for competition. Including all models, there were 1,003 Shelby Cobras built between 1962 and 1967. So exactly how collectible is the 1999-2002 BMW M Coupe compared to these American classics? While big dollar collectors are fond of the M1 and the series of “art cars,” modern production BMW’s since 1980 are not generally considered collectible for the most obvious of reasons, BMW makes too many of them. There are some exceptions…the Z8 roadster or the E30 M3, but as a rule most BMW’s (including the M models) fit comfortably along the standard mileage depreciation curve. Using that depreciation curve as a metric, the Z3 M Coupe is different. 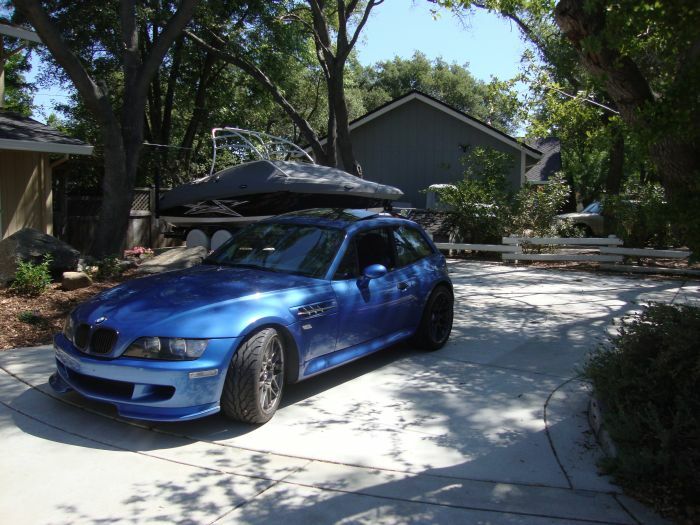 With the exceptions of the two cars that I mentioned above…no other BMW model has retained a greater portion of their value over time than the Z3 M Coupe. Just last year two low mileage S54 M Coupes in Phoenix Yellow and Laguna Seca Blue sold for over $43k each…almost 95% of their original purchase price almost a decade after they were built. The S54 M Coupes are hovering around $32k on average purchase price, and currently the average asking price of an S54 M Coupe is $32.5k. That means that the S54 is averaging about 70% of its purchase price depending upon mileage, color rarity and condition. For the S52 M Coupes that number is a bit lower at 48.6%, but it is still substantially higher than other BMW models. So what will happen to Z3 M Coupe values in the future? If you compare the production numbers of the Z3 M Coupe against almost any of the collectible muscle cars above, the Z3 M Coupe is exceedingly rare. At any given car show you are six times more likely to see a Shelby Mustang than a Z3 M Coupe. Only the truly rarest of muscle cars such as the L88 Corvette, COPO Camaros or Shelby Cobras had production runs that were less than the S54 M Coupe. Many of these collectible cars had production runs larger than all four years of Z3 M Coupe production. But does that mean that the M Coupe will be considered as collectible as these muscle cars and will see their values actually begin to increase over time? While the production numbers certainly support the rarity of these cars, the biggest variable that remains to be seen is whether the Z3 M Coupe becomes aspirational. The baby boomer generation was graduating from High School when the muscle car era reached its zenith, and many of these muscle cars were seen as being what they would love to drive if they had the means. These cars loomed large in popular culture, prominently featured in songs, movies, television and advertising, and personified freedom and individuality to their generation. As these baby boomers aged and prospered, they wanted to own the cars that they couldn’t afford when they were new, a demand that when mixed with production rarity resulted in substantial increases in value. Will the current generations get older and long for a Z3 M Coupe in the garage, or will they dream of having a murdered out Lancer EVO or an STi? Only time will tell…but unlike the M Coupe, Mitsubishi and Subaru built tens of thousands of their rally rockets. Rarity is a quality that once it is lost…never returns. “A total of 2858 M Coupes were built” … for the North American market.